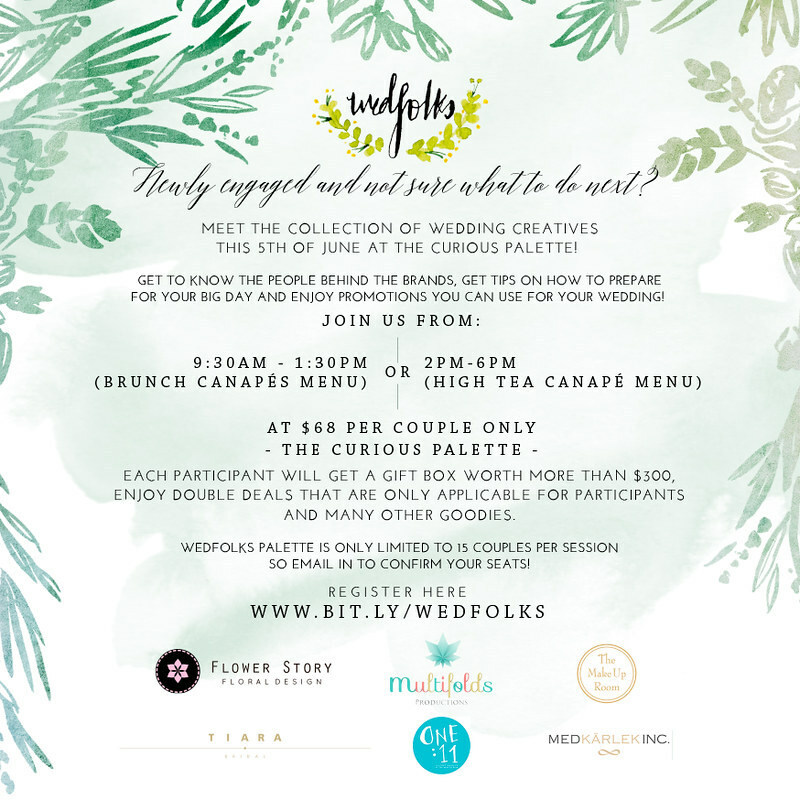 Wednesday, June 1, 2016 :: Wedfolks is here! So let me do a quick one on a Tuesday night (oh I mean Wednesday morning) before I finally get to lay my head to rest. It is all too exciting and I have to write it down or this excitement is making me lose sleep. I am going to be part of an epic initiative to share about my wedding preparation journey (YES I AM FINALLY GETTING HITCHED FO' REAL)! It is happening very soon this coming Sunday at the cosy second level of The Curious Palette. Have you been there before? So what is this event about? It is a big initiative, well you can also say TRUNKSHOW where a handful of bespoke wedding vendors (photographer, makeup artist, wedding stylist, florist, gowns) come together to present their services of merchandises to customers in a cosy setting! You get to enjoy crazy promotions during the event! I have seen the preparations and....you are definitely in for an unbelievable deal. Not going to reveal too much at this stage but here's what you can expect! 2. Double Deal promotions if you book any of the wedding folks vendors! Which also means, you save more. 5. Free consultation from all the wedding vendors! All you need to do, is to come with your BFF or fiance! P.S. Nets, Cash and Paypals will be accepted! 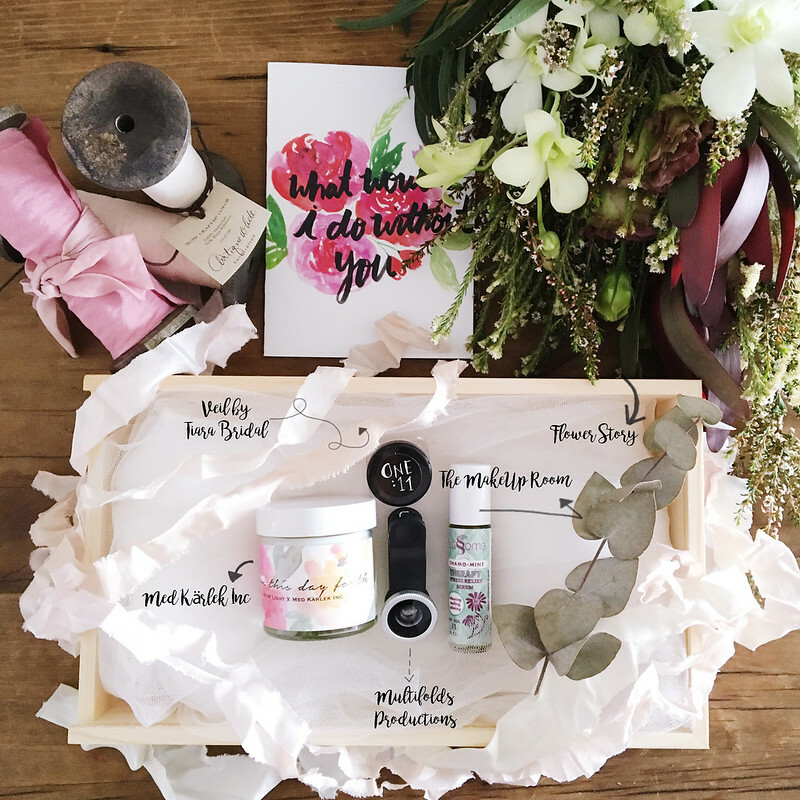 Just take a look at the gift box that you will be receiving below! Inside this box that is worth more than $350, you can expect a WEDDING VEIL and also a FISH EYE LENS just to name two of them! C'mon, wedding veil!? I would die to own it! Do you know how expensive a veil can get? I will also be bringing down some beautiful bridesmaid dresses from VainGloriousYou down on this day as well! Join me as I share about my wedding preparation journey and the difficulties that I am facing! I would love to hear from you too! For more information, check out details in this beautiful handcrafted invite below! The afternoon slots are almost sold out so hurry book your slot! Psst, walk-ins are accepted on this day as well but tickets will be priced at $88 instead of $68! See you this Sunday on 5th June at The Curious Palette! !